When is the right time for marital therapy? When is the best time to commit the appropriate resources and seek a professional for help with marital problems? These don’t seem like questions that spouses ask themselves very often, and for understandable reasons. Similar to those who might consider individual therapy, married couples want to work at and solve their own problems before they seek outside help. Realistically though, how often do ongoing marital problems get the care and attention that they need to be resolved? And how bad does the problem need to be before both members of the marriage are cued in and concerned? It seems to me that rather than being addressed, the marital relationship is actually the very thing in some marriages that go unaddressed. Ignored. Taken for granted. For whatever reason, the bond of love between the two spouses gets sacrificed for everything else. The “right time” to refocus our attention, repair lost connection, and grow in love becomes obvious when we properly prioritize our marriage. And for many, a formal recommitment focused on rekindling the marital relationship is difficult. Complicated. Because a lot can happen to that bond over the rough and harried years of marriage. 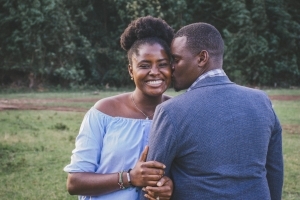 Here at Ruah Woods Psychological Services we conduct marital therapy using a model that honors this bond, tracks how it has deteriorated, and guides the couple in regrowing it. The model is called Emotionally Focused Couples Therapy, or EFT for short, and was created by Dr. Susan Johnson. There’s a lot to say about how we use this model to help couples, but I’d like to highlight just a few things worth reflecting on in this post. Call it marital atrophy, ongoing conflict, or falling out of love… Whatever the term, the marital relationship often doesn’t feel the same as when it began years prior. Maybe it has gotten stronger in some ways, but for many, the relationship has endured consistent conflict and neglect that has wounded it and weakened the sense of closeness, security, and safety the couple shares. This automatic, repeated, injurious pattern within the couple is formally called “the cycle of conflict” in the EFT model. While this might seem like a strangely obvious insight to make, we are actually regularly surprised by how unaware couples are of their cycle of conflict (often referred to as just their “cycle”). And this is not to blame the couple! The truth is, the cycle is quite insidious! Such cycles are routinely formed in the context of both partners trying to secure the love and support they desire from each other. Though patterns vary, it often involves one partner trying to reach out to the other to reestablish a sense of security, often in a panicked or aggressive way, while the other partner tries to deescalate and withdraw from interaction in an attempt to preserve the relationship, prevent further damage, and protect a sense of safety and self-worth. This very common give-and-take sequence is called a “pursue-withdraw” pattern. Both partners value the relationship and the other person, but their respective strategies aren’t always well understood or appreciated by the other. In both cases, there is a deeply rooted human need for safety and security that each is trying to acquire called “secure attachment” (more on attachment later). The stresses, trials, and wounds of the marriage (and past relationships) degrade a person’s trust and emotional responsiveness to their partner – in other words, they often bear wounds from current and past relationships deep in their hearts that make it hard to trust that their spouse will really be there for them when they need it. This mistrust then grows up over time like a nasty weed through many iterations of the cycle of conflict, each time pushing the spouses farther and farther apart. So a very early task in our marital therapy is to take account of these deeper wounds (which will guide later therapeutic work), and, to become intimately knowledgeable and aware of the cycle of conflict. 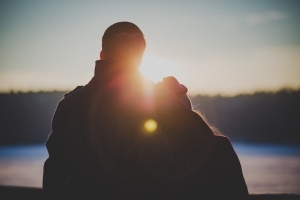 Not only has the cycle contributed to ongoing damage to the marital bond, but it is quickly and easily triggered in the context of marital therapy, making healing difficult. 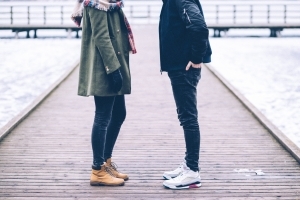 If the cycle can become acknowledged, understood, and rightfully be made the enemy of the couple, their conflict often cools off, and other productive emotions such as concern, curiosity, and compassion can be felt. “Why does he pull away just when I’m desperate to talk?” “Why is she so hard-up to talk, when we know it’s just going to lead to a fight?” Because under all the demanding criticism and thinly-veiled resentment, under the flat statement “I’m fine” and the shut-down countenance, are two wounded people that care about each other. But the cycle obscures this reality! Because of the cycle, each person grows in their conviction that their partner doesn’t care. And so the first task is to see this cycle clearly and to name it the great enemy of the couple. The good news is, even for marital relationships that have been neglected or damaged, there is hope. Prayerfully consider if now is the time to invest in your marital relationship – is couples therapy appropriate for you? An established, monthly date night? An hour, one night a week where you sit on a couch, look at each other, and talk about your relationship? Or maybe you could read a book together and learn more about the cycle and how to fix it? Consider Love Sense (we regularly suggest this to our couples in therapy) or Hold Me Tight, both by Dr. Sue Johnson.